Navigate to the Data Access tab of the toolbar at the top of the screen. 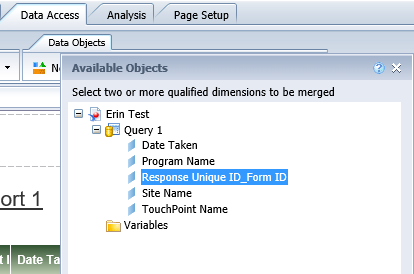 Under the Data Objects sub-tab, select Merge. 3. Select objects from individual queries while holding the CTRL key. 4. Click OK when complete. The merged dimension will have now been created and will be visible in the Merged Dimensions folder under available objects. To change the name or edit the merged dimension, you can double click on the merged dimension in your list of available objects. Under the Available Objects window, click the new Object and the Merged Dimension while holding the CTRL key. Now, under the Merged Dimension, it should show the previous Objects that were merged, as well as, the new Object.